They are the only company in the world licensed to extract and supply Preseli Bluestone for commercial purposes. This is the first time for Millennia that these unique and magical stones have been seen in their polished form. I first visited Stonehenge as a small child and became fascinated by what to me seemed a place of magic and fairytales. During the 1980s I lived in the Preseli Hills in West Wales, near to the actual source of the inner Bluestone circle and began to realise that there was much more to Stonehenge than I had ever imagined. 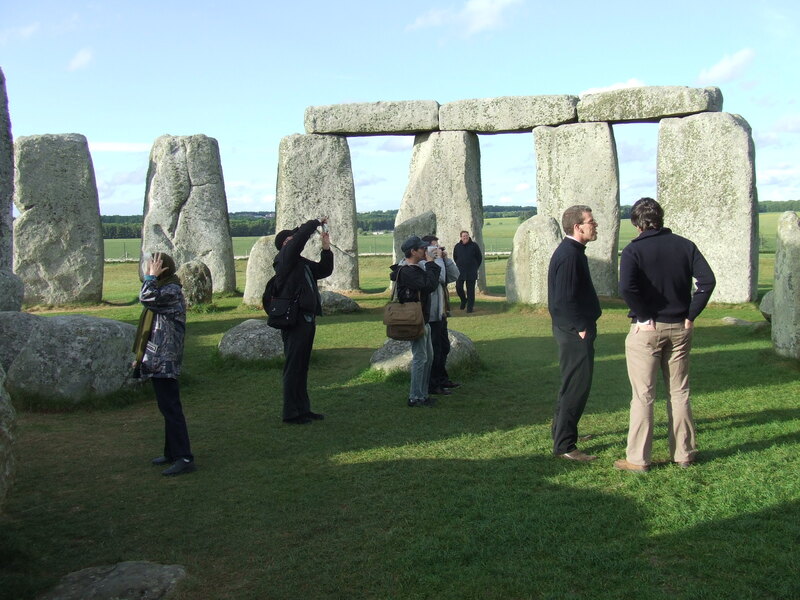 For centuries, Stonehenge has fascinated the peoples of the world and even today, with all our modern wonders, it receives almost a million visitors per year who travel to Salisbury Plain in Wiltshire, England just to spend some time basking in its magic. "Who? why? how?" are the questions that have captured the public's imagination. Most tourists when they think of Stonehenge immediately bring forth to mind the huge trilithons made of Sarsen stone, a stone local to the Marlborough Hills in Wiltshire, but for me the real magic is to be found in the inner horseshoe made of the Preseli Bluestones. The development of Stonehenge can be divided into several phases. The earliest archaeological evidence dates the beginning of Stonehenge to around 8000 BC when the site was cleared in the centre of a forest there, with an avenue leading to the nearby river at Amesbury. Postholes that possibly held 'totem' poles have been found, aligned east-west and could have acted as equinox-sighting markers. In 7460BC the whole of the British Isles was inundated with flood waters due to a comet impact. A 1000 years later these two posts were replaced by two more poles only 350 metres away from the originals, also aligned east-west. The next phase was the building of an embankment and ditch around 3020BC. Unusually for a henge, the ditch was built outside the bank. The ditch (moat) was 97 metres in diameter: 6 metres wide and between 1.3 to 2.1 metres deep. The builders then erected two parallel entry stones on the north east of the circle, aligned to the summer solstice sunrise. Just inside the bank they also dug and almost immediately refilled a circle of 56 shallow holes known as the 'Aubrey holes', possibly to hold sighting poles used to predict eclipses. The site appears to have been in regular use until around 2600BC when it was abandoned for almost half a millennium. Around 2100 BC the Preseli Bluestones were brought from West Wales and erected in a circle (the X and Y Holes) also aligned to the summer solstice, and a widened approach was constructed. Around 100 years later, this first Bluestone circle was dismantled and work began on the final stage of the site. The Bluestones were rearranged in the horseshoe and circle that we can still see today. The next phase of Stonehenge saw the arrival of the Sarsen stones which were arranged in an outer circle with a continuous circle of lintels. On the inside of this five trilithons were placed in a horseshoe arrangement, part of which we can still see today. Since that time, Stonehenge has been systematically destroyed and recreated by various peoples throughout history. The most recent reconstruction took place as late as the 1960s. The only way an accurate picture can be visualised of a complete Stonehenge is through the plan of the holes in the ground. Although we now believe that we know how the stones were erected, the reason why the Bluestones were brought from over 250 miles away from the Preseli Hills in Pembrokeshire, West Wales has remained a mystery. There has been much speculation and research as to how the feat was achieved. The mythology attached to the moving of the Preseli Bluestones to Stonehenge has been attributed to the magic of Merlin. In Geoffrey of Monmouth's Historia, Aurelius Ambrosius sends his brother Uther to bring the Giant's Dance from Mount Killaraus in Ireland, at the suggestion of Merlin, to be used as a memorial for the dead slain in the Night of the Long Knives. It is probable that this account contains a trace of an oral tradition that the stones were transported from a great distance, over water, by 'superhuman' powers. At this time, the Preseli Hills were ruled over by the Kings of Ireland. However, the Merlin talked about in the 12th Century and the Merlin of the Welsh legends supposedly existed during the Dark Ages, some 4,000 years after the Bluestones were moved. To medieval man in Geoffrey of Monmouth's time, the stones were so huge and unwieldy that none of their own engineering techniques would have been capable of moving or erecting them, so it is only natural that they believed that such an undertaking was a magical one. As Arthur C Clarke said "Any sufficiently advanced technology is indistinguishable from magic", although perhaps in this case it should be considered as any sufficiently different technology. One current theory speculates that the stones were dragged by roller and sledge from the inland Preseli Hills to the sea at Milford Haven. From there they were sailed along the Welsh south coast to Bristol, then up the Avon to a point near what is now Frome in Somerset. From there the stones were probably pulled overland to a place near what is now Warminster in Wiltshire and then floated down River Wylye to Salisbury, up the Salisbury part of the Avon river to West Amesbury, near Stonehenge. In 2000 a group of local volunteers from Pembrokeshire gathered to attempt to re-enact this ancestral journey by moving one three-ton Preseli Bluestone block from its source in the Preseli Hills to Stonehenge as a Millennium Project. The idea was to use wooden rollers for the land routes and a curach raft for the sea route from Milford Haven to Bristol and then to take it up the River Avon with the final overland journey to Salisbury Plain. Unfortunately the design of the raft failed and the project was abandoned through lack of funds. In fact, this was not the first time that such a project had been undertaken. In 1954, the boys from Bryanston and Canford Schools in Dorset attempted a similar feat. They moved a four-ton concrete block over a short distance of land and floated it to show that such a thing was possible. Another recent Stonehenge project was the raising of a 40-tonne trilithon made out of concrete that a team of engineers successfully completed for the BBC series "Secrets of Lost Civilisations", using the ancient technology of levers and wooden A frames. 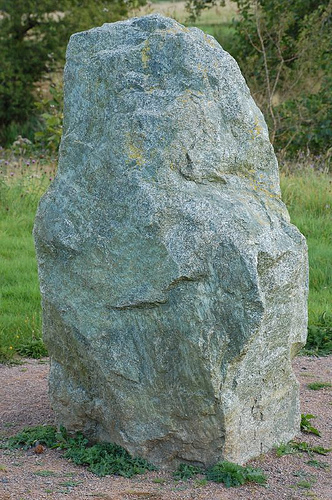 There are still some academics who believe that the stones were moved by glaciation as 'erratics', but our having recently submitted Preseli Bluestones to geological analysis and that of previous researchers concludes there is no doubt that all of the 45 Bluestones left at Stonehenge come from the Preseli Hills, with each stone identifiable to specific areas of those hills and they have no glaciation markings on them. There are certainly no other stones on Salisbury Plain showing glaciation markings. The environmental archaeology of the area also disputes this geological theory (see Boscombe Bowmen). The 45 remaining stones at Stonehenge, now called Bluestones, are in fact a mixture of spotted dolerite, blue dolerite, rhyolite, volcanic ash and one of Cocheston sandstone (which is a pale green stone studded with garnets). This particular stone is commonly called 'The Altar Stone' and also has its source near Preseli. It would thus seem that they had a very particular 'shopping list' when they chose their stones, although the effort in obtaining them was considerable. Of course, there is no reason to suppose that these primitive people were not able to harness the use of beasts of burden to move the stones across land and so the difficulties of the movement and the erection of the stones are now overcome but we are still left with the question why? Why these stones? Now at last, after 5,000 years, we believe that we have uncovered this part of the mystery. The geological name for Preseli Bluestone is Dolerite which is an intrusive volcanic rock of plagioclase feldspar and is in fact harder than granite. Forms of dolerite are found all over the world and were used for making tools to work on granite statues in ancient Egypt. Polished Bluestone axe-heads from Preseli have also been found but whether these were ceremonial axe-heads or actually used as tools is unknown. In 2001 I discovered a memorial stone in the Preseli Hills which had been polished and then, during a geological survey, the Bluestones were cut open and then the proverbial penny dropped. Inside the stones we found feldspar crystal formations and mica. When polished, the stone looks like the night sky studded with stars and now, having seen its beauty when polished, it seemed obvious to me that this was reason enough to move them and erect a circle of them. The ancient Egyptians revered Lapis Lazuli (Blue Stone) for the same reason. The Preseli Hills themselves are crisscrossed with ley lines, ancient trackways, standing stones, burial chambers and stone circles and the hills sparkle with shining white crystal quartz. Even during early Christian times, the place was considered almost as holy as Jerusalem and Rome. This is also the land of Druids who still continue this 5,000-year old tradition of building stone circles in Wales each year for their National Eisteddfods. Locally, the stones are considered as stones of healing and magical and as stated in the early Welsh mythologies, such as the Red Book of Hergest and the Black Book of Carmarthen, Merlin transported some of them to build Camelot, thus Preseli is Merlin and Arthur territory, home to the fairies and gods of the Underworld. It has also been speculated that Stonehenge was built as an astronomical observatory and to have a circle of standing stones polished to such a degree that they looked like the night sky seems fitting. It also seems possible that the whole of Stonehenge was also dressed and polished and that Salisbury Plain where it stands is another candidate for the 'Round Table'. Early in the 20th century the English astronomer Norman Lockyer demonstrated that the north- east axis at Stonehenge aligned with the summer solstice sunrise. This led other scholars to speculate that the builders were simple sun worshippers. In 1963 an American astronomer Gerald Hawkins, argued that Stonehenge was a complicated computer for predicting lunar and solar eclipses but such "romantic" interpretations were severely criticised by the archaeological establishment, who preferred their own baseless speculation that it was a place of pagan worship built by 'primitives'. One would think that an astronomer would have far greater qualification to assess any possible astronomical qualities for the structure, even if its early dating happens to mean that it is considered the property of archaeologists. Archaeologists are very good at digging and dating, but many of them seem to think that it is illegitimate to try and understand the motivation and mindset of the people whose debris they examine in minute detail. So what is it that made the Preseli hills and Stonehenge so special and of such significance to pre-historic sky watchers? The answer lies with a strange property that would have been of immense importance to them. At Stonehenge's Latitude 51¡.10«.42««.N, at the time of the Equinoxes (around 21st March and 21st September) the rising sun appears exactly due east and the setting sun due west, causing the morning and evening shadows to align in a straight line. On every other day of the year the sunset and sunrise will occur either further north or south and will not line up. Furthermore, at Stonehenge's latitude, a similar alignment also occurs at summer solstice (the day of maximum daylight, around June 21st) and on the winter solstice (the day of minimum daylight, around December 21st), when the line of sight to the rising sun is in a direction precisely the reverse to that of the setting sun. The 'Heel Stone' at Stonehenge demonstrates this by its shadow In simple terms, this means that when the solstices are viewed from Stonehenge, the shadow cast by a pole placed to mark the position of the sunrise on the horizon will perfectly align with a shadow cast from a second pole marking the sunset. This latitude continues due west to Lundy Island in the Bristol Channel whose longitude (4 degrees 40 minutes 15 seconds West) which then continues north through the Preseli Hills. This triangle of sight exactly replicates the triangle formed at Stonehenge by the 'Station Stones' which form part of the Aubrey circle to the ratio of 2500:1. These are just some of the Secrets of the Preseli Bluestones. We expect more to be revealed as research continues.